If, at some point in the not-too-distant future, you happen to be walking around downtown and you see a bag lady pushing a cart full of Urban Decay Revolution Lipstick and mumbling to herself, please say hello, because that bag lady will be me, and that lipstick will have been the cause of my financial ruin. 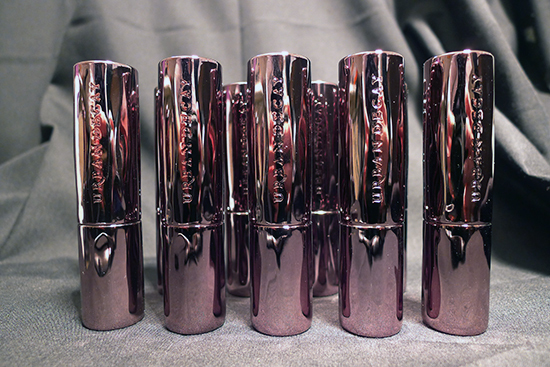 Urban Decay Revolution Lipstick ($22) was released earlier this month. 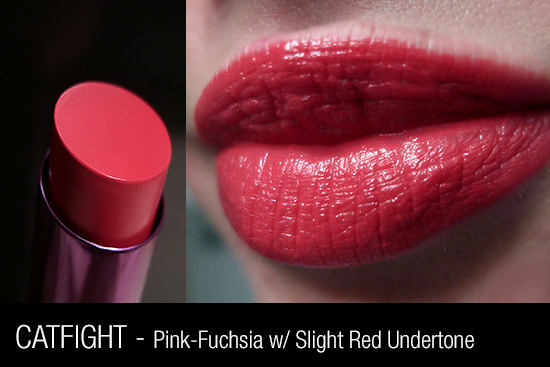 This lipstick is marketed as being highly pigmented, long wearing, and hydrating, and after trying them out for myself, I can confidently say that the claims are true on all counts. In terms of wear time, the lighter colors seem to have less longevity than the deeper shades – I get about 4 hours of wear from the lighter shades, while the deeper colors last for nearly 6 hours with normal talking and drinking. I still had to reapply after eating, but I have yet to meet a lipstick that can withstand a food frenzy. 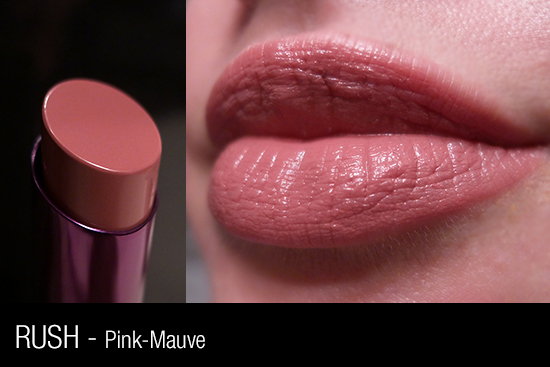 Revolution Lipstick wears down nicely though – even after the lipstick is gone, there is a nice, even stain of color left behind, and no weird color rings around the outer edges of the mouth. 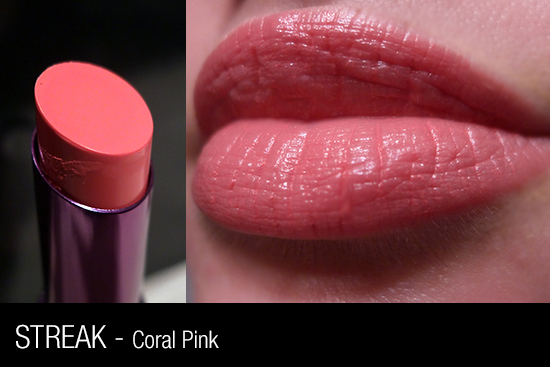 Revolution Lipstick is extremely moisturizing – even more so than my Revlon Lip Butters. The formula contains jojoba oil, avocado oil, olive oil, cocoa butter, and shea butter, so this shouldn’t have surprised me, but it did. Notably absent from this ingredients list is fragrance, which is great news for those who couldn’t stomach the smell of the old UD lipstick formula (I never smelled them myself, but several people have mentioned it to me). 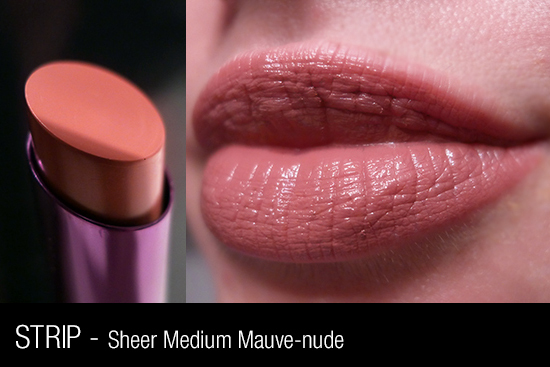 According to COSDNA, there are quite a few acne triggers in this lipstick, but I’m not terribly concerned about this since I will not be rubbing it on my face (that would be wasteful!). Oh, and before I get my swatch party started, I would be remiss if I didn’t mention how lustworthy the packaging for this lipstick is. The case is slim and elegant, but it has some weight to it so it feels substantial and expensive. The finish is a gleaming rosy metallic, which you’d think would be a fingerprint magnet, but they are surprisingly invisible on these cases. I would know – I’ve been handling them all with my grubby, little, makeup-laden hands, and they still look shiny and new! Official swatches from the Urban Decay website. There are 22 colors in the collection, and there’s not a loser in the bunch. This is actually a problem for me – I’ve had such a hard time paring down my color choices that I’ve already managed to amass 10 of these lipsticks, and I – uh – may or may not have more on the way. 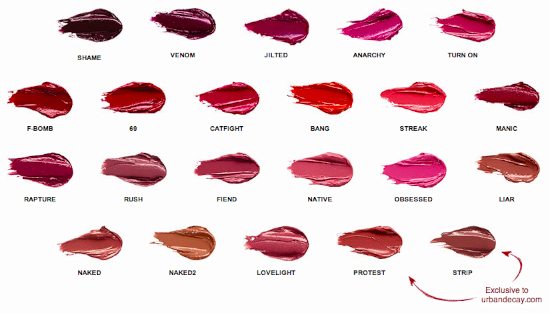 The colors I’ve picked up so far are Catfight, F-Bomb, Jilted, Liar, Manic, Protest, Rapture, Rush, Shame, Streak, Strip, and Venom. 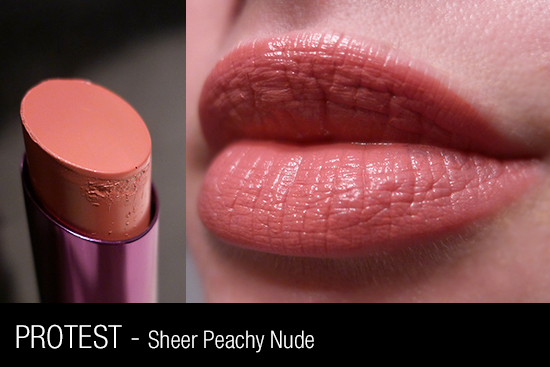 EDIT 07/29/2013: Added Jilted & F-Bomb swatches! The remarkable thing about these swatches is that I did them after wearing Urban Decay Revolution Lipstick in Rapture all day, which means I was able to see the full effects of the lip plumping ingredients. 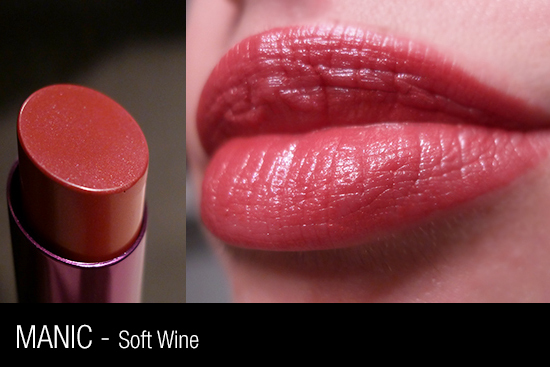 There is a visible increase in smoothness in these swatches compared to my other photos, in which I was not wearing the Revolution Lipstick all day prior. Neat! 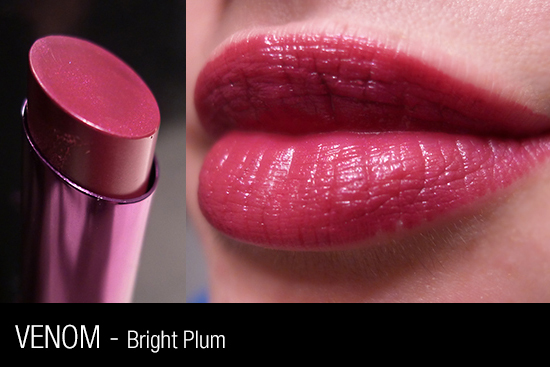 Value: 4/5 – $22 might be steep for most lipstick, but the quality of these are out of this world. I’ve seen plenty of $30+ lipstick that doesn’t perform as well as this, and in that regard, I think $22 is a great value. I bought most of my Urban Decay Revolution Lipstick from Sephora so I could rack up some VIB points on this splurge (I’ve got you in my sights, VIB Rouge! 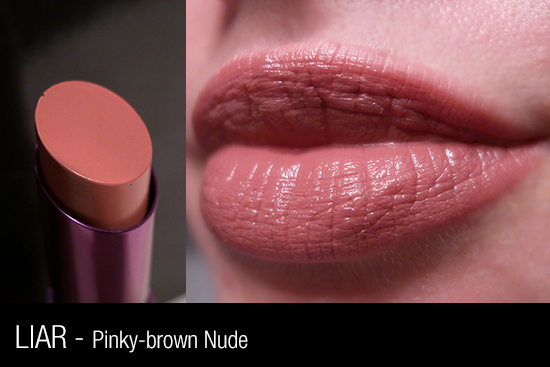 ), but there are a couple of shades – Protest and Strip – that are exclusive to the Urban Decay website. There are also some shades available at Ulta. 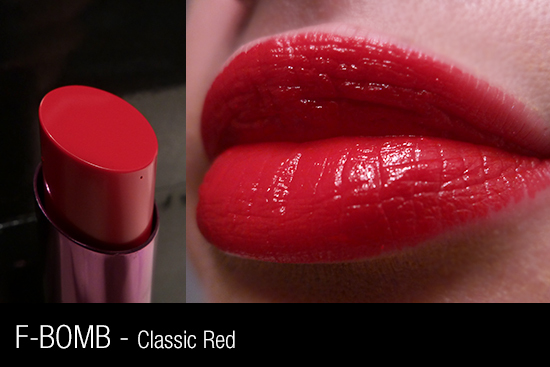 This lipstick retails for $22 at all locations. Are any of these colors calling your name? Which one is your favorite? You’re going to love manic! Do you think you’ll pick up the lip pencil too? I’ve got my eye on a few of the new lip pencils but haven’t tried any of them yet. I bought both and love them together (liner and lipstick). However, it was a little steep for my budget. 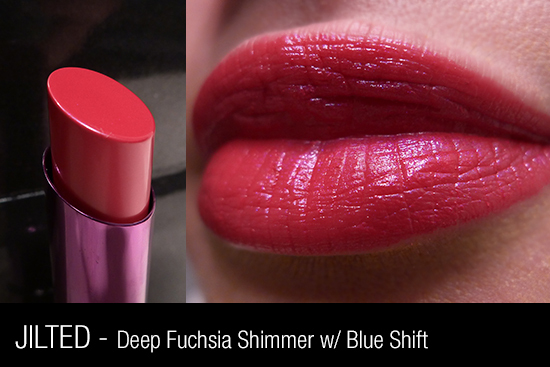 Do you know of any good dupes for manic? Your swatches look soooo pretty!! I have my out on Streak and Rapture now. The colors look so wearable and pretty. Great choices – I think both would look amazing with your skin tone (at least, what I think your skin tone is based on your blog photos). You definitely should! And if you pick any up, I’d love to know what colors you get! I love your swatches! These look so creamy and pigmented. Thank god Urban Decay isn’t available in Australia or else my wallet would be in trouble. Aw man, yeah! I guess not having any UD around is a blessing and a curse! So, I’m curious – is Urban Decay totally unavailable in Australia? Are there not even any websites that ship it there, or is the mark-up just too extreme? I’ve been wondering about this for a while, ever since I saw someone mention the lack of UD down under in a forum I frequent. I think you are definitely going to be in trouble because all those colors look great on you! Aw, thanks! I should probably start practicing wearing all my coats and jackets at once, you know, like a hobo. A really glamorous hobo. Expensive, but gorgeous. *w* I like venom on you best. “Expensive, but gorgeous”is the perfect summary for these! I would love to see this phrase incorporated into the UD point-of-purchase displays. I’m wearing one of the pencils for the first time today. 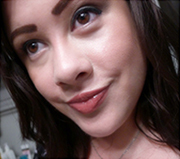 I have on the Liar pencil with the Liar lipstick, and I like it! How are you liking the pencil/lipstick combo? I am in love… I picked up 69, Anarchy and Streak. 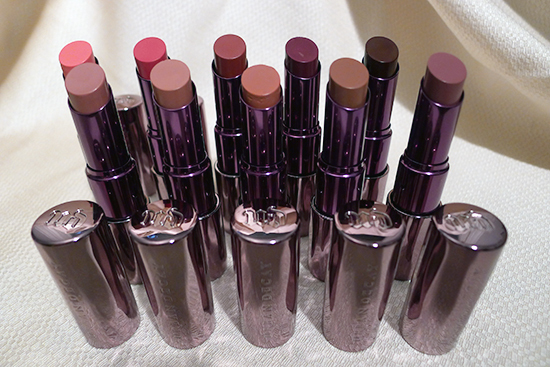 I wish I could pick up all of the shades. Your review is spot on! F-Bomb is absolutely amazing. 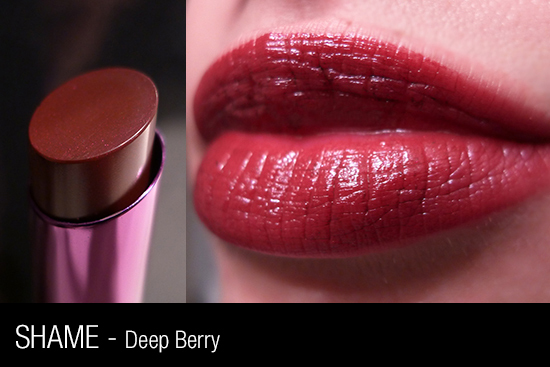 It is such a gorgeous deep strawberry red. I loooove Jilted. My favorites change every day, but lately, I have been all about Jilted and Rapture! 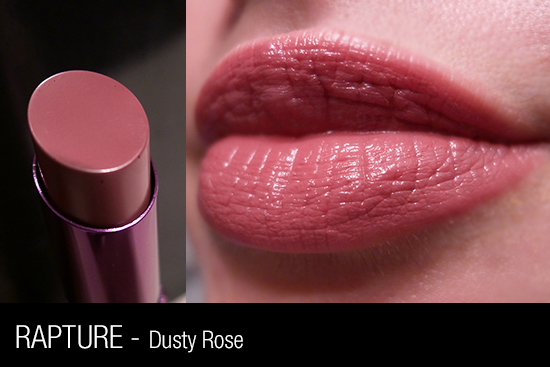 Do you know of any dupe for shade Streak?